Has the Shine Come Off the Salesforce.com Apple? Let’s give credit where credit is due. Salesforce.com paved the way into the cloud based Customer Relationship Management (CRM) software sector with a unique offering that made good sense for customers who were tired of spending months of time and thousands of dollars struggling to implement desktop software applications. Being the first company in the SaaS, or software as a service sector, Salesforce.com was able to charge a hefty price for their offering and companies were more than happy to pay it. But that was then and this is now. Today the CRM software sector has become highly competitive with literally hundreds of vendors offering some component of what is known as CRM. In fact many industry analysts and consumers of CRM software believe that CRM is quickly becoming a commodity market and I would tend to agree. The first sign of commoditization of any market is price erosion. We have seen this across numerous industries like consumer electronics for example and we are now seeing it in the CRM sector as well. In fact, over the past 24 months we have seen Salesforce.com repackage their offering on several occasions. The repackaging is really nothing more than a clever way to reduce the cost to the consumer by offering product editions with fewer features. But let’s be fair here. The same can be said for Salesforce.com main competitors SugarCRM and Commence CRM. However these companies never had super high price offerings to begin with so they don’t have the same business challenge going forward that Salesforce.com does and that’s customer renewals. Customers who were once happy to pay premium prices for Salesforce.com’s unique offering may not be so eager to renew at the same high cost particularly when similar offerings from top rated CRM companies like Sugar and Commence offer significant savings. I don’t think customers will be racing to change CRM vendors, but I do think that Salesforce.com will be forced to reduce the renewal cost to these customers or risk losing them to competitive offerings. Either way this has got to be a concern for the company. Of course time will tell. History has taught us that the commoditization of any product or service is only good for the consumer. But hey, that’s not a bad thing. 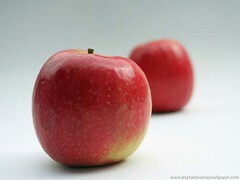 Image “Fruit – Juicy Red Shiny Apples” by Digital Wallpapers on Flickr under Creative Commons license.